Orb I was made by Brandon Zebold in 2005. The 6′ sphere at the intersection of Skyliners Road and Mt. Washington Drive has been compared to a bowling ball heading from the Phil’s Trail complex downhill toward the Deschutes. Dont be fooled by the name; there is no Orb II. 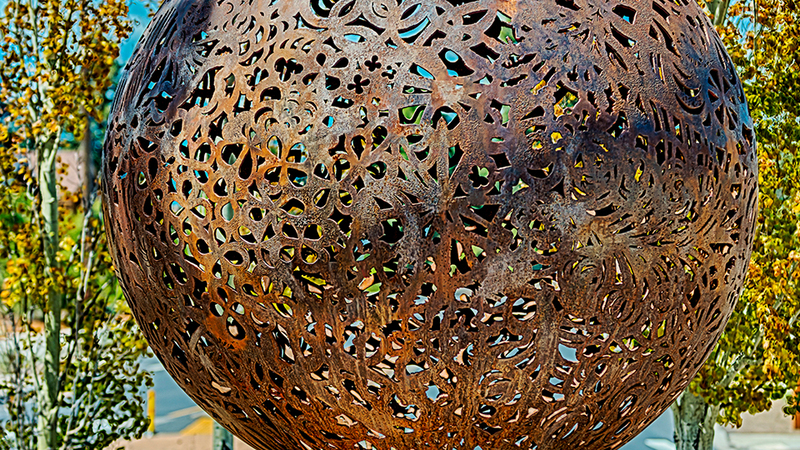 Our orb was created with an oxyacetylene torch on steel by an artist who approaches making art in a “serious and yet playful way.” With his site-specific work, he hopes to “tap into a location’s history and culture” and give a sense of “the place and its people.” Plus, you get to say “orb.” Orb.